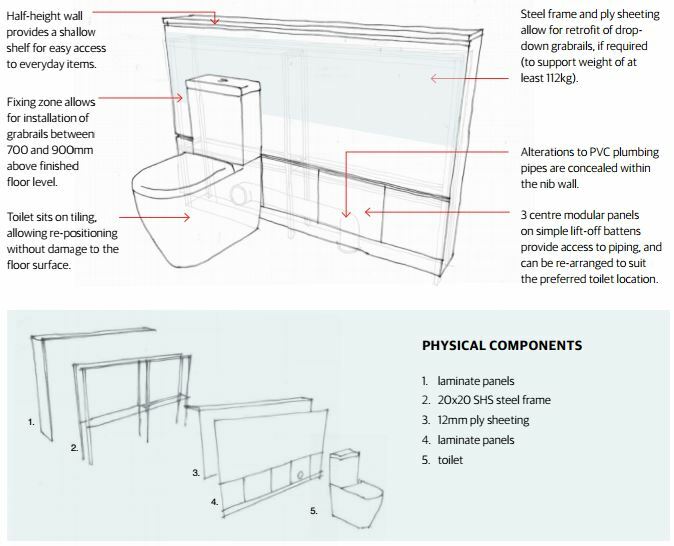 Accessible and adaptable housing design for people with disabilities have been long recognised in the design and construction industry. These concepts have materialised in the form of Australian Standards, guideline documents and organisations championing them. Most notable in recent times are the Australian Standard AS 4299:1995 Adaptable housing and Livable Housing Australia’s Livable Housing Design Guidelines, given their referencing in municipal planning schemes as well as state and federal government funding initiatives. By necessity, these have served to address the needs of people with disabilities as generically as possible. That is, allow for the cost effective adaptation of housing to meet the needs of a very diverse group of people. People in this group may have varying mobility difficulties; sensory difficulties be they visual, hearing or tactile; physical difficulties; and intellectual or cognitive difficulties. Add to this the complexity of also allowing for an equally diverse range of essential assistive technologies. These include, but are by no means limited to, walking aids, manual wheelchairs, powered wheelchairs and scooters to assist mobility; shower and toilet commodes, mobile and ceiling mounted hoisting systems to assist with personal activities of daily living; as well as electronic aids to daily living such as automated doors, doorbells and telephones with light indicators, or wired or wireless integrated home automation systems. In attempting to be all things to all people, many have noted that some cohorts within the broader group may not see adequate representation in the inclusions to these standards and guidelines. The Summer Foundation is an organisation which has been working toward change in human services policies and practices as they relate to young people living in, or at risk of living in, residential aged care facilities. By nature, the group they advocate for therefore generally also have complex support needs. One of their activities in achieving their advocacy goals is developing demonstration housing projects to encourage others to replicate their model for housing and increase the range and availability of housing and support options. Following the completion of recent project in Abbotsford (Victoria), the Summer Foundation has published a report intending to outline their learnings and insights. The document is called New Housing Options for People with Significant Disability – Design Insights, and is available as a free download (or hard copy purchase) on their website. The report provides some background information for the projects. This includes discussion regarding the reasons for selecting locations, the partnerships that were necessary to see the projects reach fruition, and the support models being developed and implemented. While all worthy items for discussion, ideas and the detailing of common adaptability barriers best relates to the building industry’s relationship with adaptability. Below are a couple of examples of potential solutions which arise in the report which also deviate from can be currently noted as standard practice and the established relevant Australian Standards and guidelines. People of differing abilities and needs may transfer on to the toilet from a particular side, or require assistance from one or two carers from either or both sides of the toilet. In some instances, they may also use a static or mobile commode that is placed or manoeuvres over the pan. As such, a pan located within a particular internal corner may only serve for a relatively small proportion of potential users. They propose the construction of a ‘dummy’ wall to conceal additional services for future relocation of the pan. A pan with a P-trap is then fitted to the lower section of the wall which is clad with modular laminated panels allowing reconfiguration depending on pan location. Wheelchairs and mobile commodes vary in size and shape dramatically for a variety of reasons. Basin height and clearances to enable suitable approach and positioning can therefore be problematic with regard to adaptability. 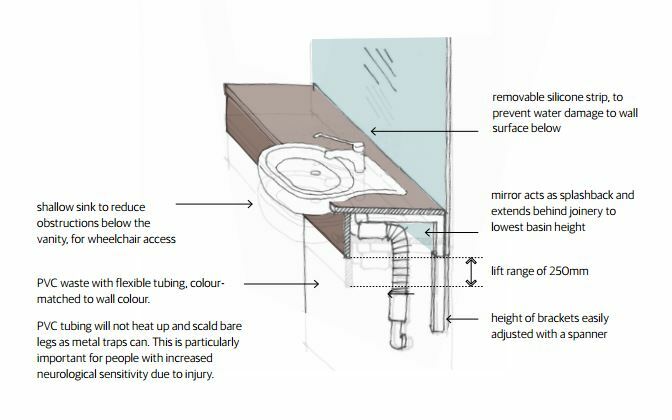 The guideline shows a solution where a mirrored splashback is extended below the height of the basin. The vanity is mounted on adjustable brackets and the basin is fitted with flexible piping. Adjustments would therefore be made without any material modifications other than the removal and subsequent addition of caulking at the bench top and splashback junction. There are a great many other examples, many of these already used extensively in adaptable housing projects and others which are novel and innovative in their approach. Some of the suggestions included will raise some question marks from designers and builders with regard to issues such as trade sequencing and scheduling, waterproofing/water resistance, as well as finding the right balance between initial capital expenditure and deferred cost in modification. It is, however, a well-presented and thought out guide which will hopefully encourage further discourse and innovation in an area which sorely needs it.